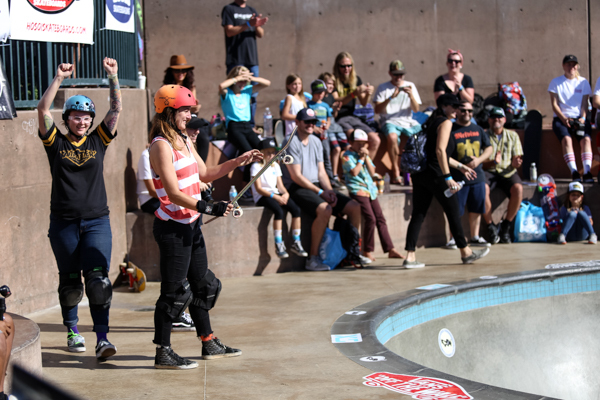 This past weekend, the Exposure women’s skateboarding event went down for the fifth consecutive year, co-founded by Amelia Brodka, and with a mission to empower women through skateboarding. 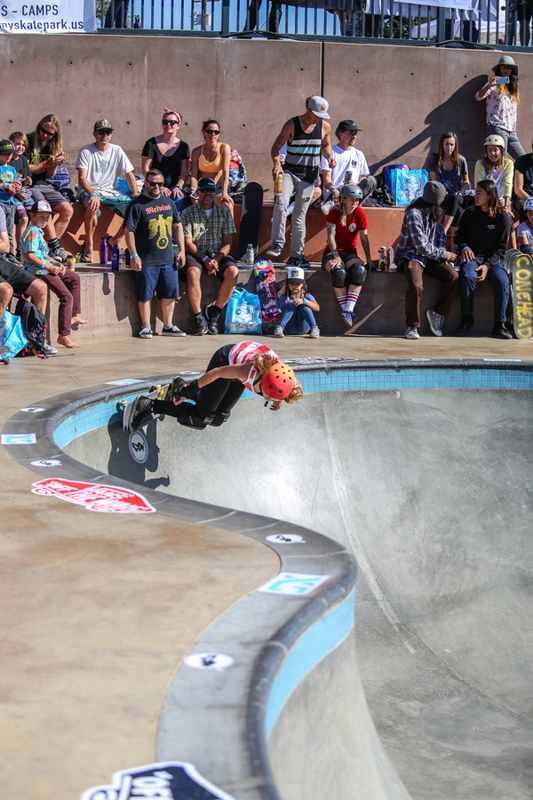 This year, the event held an amazing turnout once again, and attracted skaters, photographers, and spectators from all around to attend the vert, street, and bowl competitions. 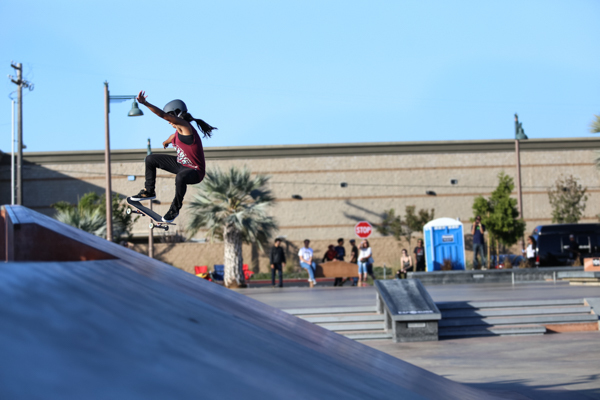 With women’s skateboarding on the rise, and with the introduction of skateboarding to the olympics in the near future, women’s skateboarding is clearly gaining further momentum. If you don’t know about Exposure skate and the annual competition, here’s a little rundown on it. 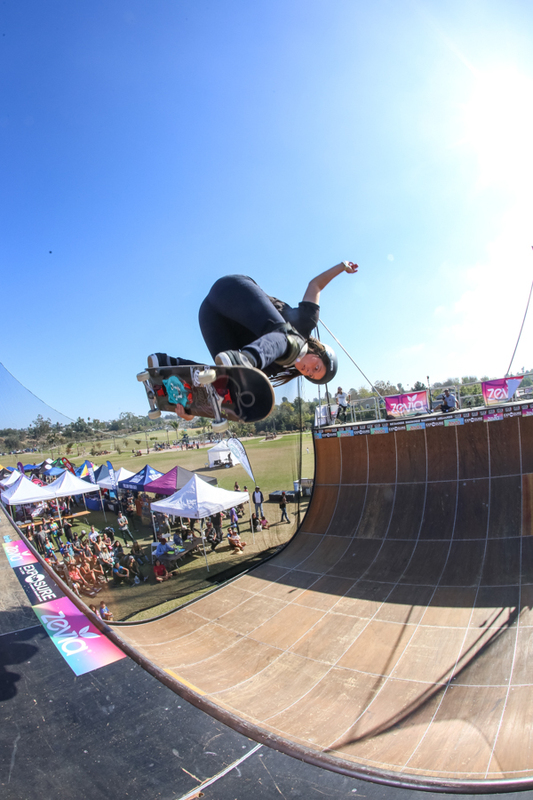 Created in 2012 after the removal of women’s vert and bowl events from most significant skate events, Amelia Brodka co-founded exposure along with Lesli Cohen and a team of volunteers. 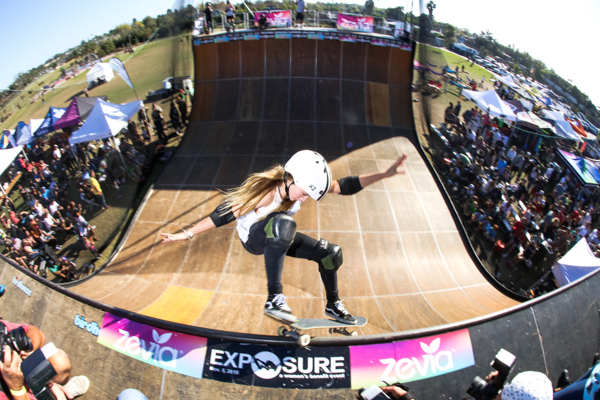 Since 2012, Exposure has hosted the world’s biggest all-female skateboarding event each November, based out of San Diego, with the past two years at the newly developed Encinitas Skate Plaza. 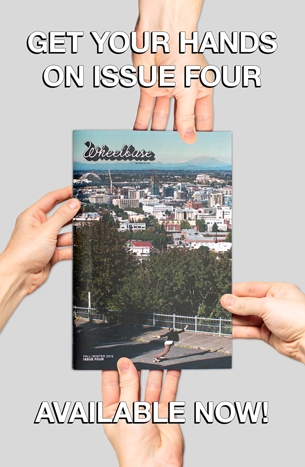 Exposure is a nonprofit organization, and in addition to expanding the reach and impact of women’s skateboarding, a portion of proceeds from the event go towards domestic violence aid and resources. This year’s event held a $50k prize purse itself, and over $50k has been donated to survivors of domestic violence to-date. The event holds over a hundred global female participants, and draws over 5,000 attendees. 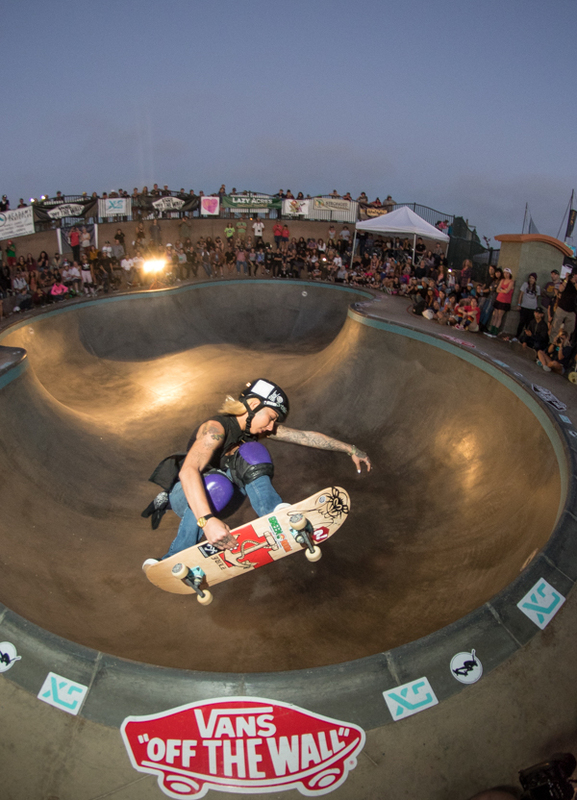 This was my second year shooting the event, and once again I was amazed seeing so many women skaters shredding and shining a light for even more to get on board and push things forward. The event started for me on Friday, setting up alongside Amelia, Dave Bean, Curtis from Skate the Lake, and several other volunteers; as the day progressed, the event setup came together and transformed from empty soccer fields, a mellow bowl, and a community park to an all out event consisting of a sea of vendor and sponsor tents, the portable vert ramp towering above, as well as bleachers, banners, and more. We pulled together the event on site, and I have to give major props to Amelia for doing so much work all year in anticipation for this event; just setting up and tearing down took its toll, but so much other preparation, communication, and creation goes into this event, combining what would seem a full weekend’s contest into a single day of stoke. As Saturday came around, I returned to the plaza and what sat empty the night before was packed in with vendors, mass amounts of spectators, and a wide range of girls warming up for their events. 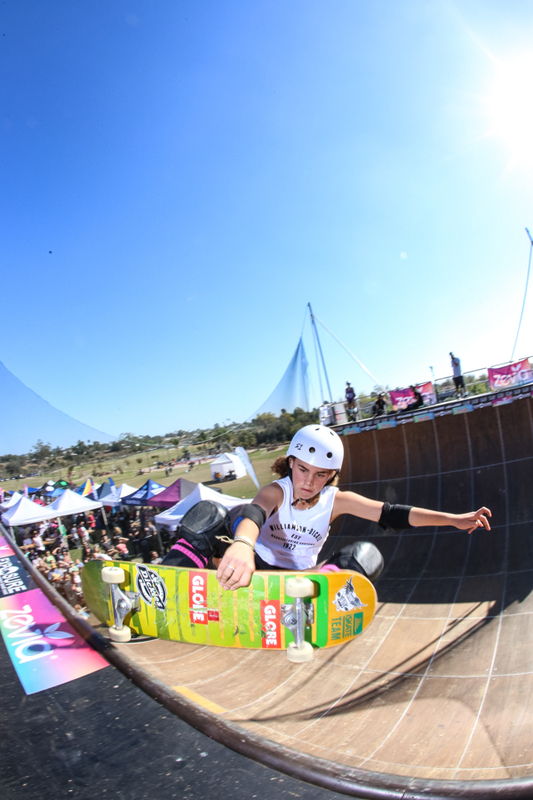 It was really impressive to witness Exposure connect all these girls from 4 to 40 years old, all around the world, and with all different skate styles and abilities. The day started with the AM division tearing up the bowl, and was full of younger girls throwing early airs, tons of surf style shaka-throwing carves, and overall style. Even so, the crowd went the wildest when a newer girl to the sport, who had been pumping from the flat bottom all morning, dropped in on poods for her first time. A great opening to my Saturday morning, it wasn’t an overly competitive or harsh environment, but one of support for each other and building up the community. Girls were skating for themselves, and getting stoked on what they could do, and what they were progressing towards. As lunchtime approached, the AM competitions continued on at the bowl, but other girls began taking to the vert ramp and street section for practice runs, and more and more spectators poured in from every avenue of the park. After grabbing a few burritos, we returned to the site to document the street and vert competitions. The vert competition, like the bowl competitions, held an AM and Pro competition, and as photographers packed elbow tight onto the vert deck, the AM girls began to compete. I could tell many of these girls had just started skating vert, and a few were even going at it for the first time saturday, and I have to give mad respect to them for going at it and pushing their limits. 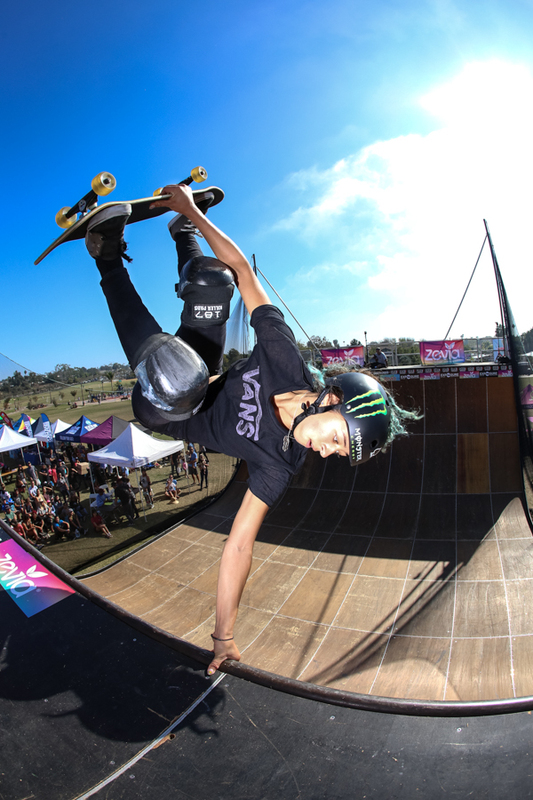 Girls in skateboarding are progressing more than ever, and to see girls start out on vert ramps at exposure, popping humble airs and slash grinds, to owning it the next year, it is truly amazing. The Pro class went on as well, and with this selection, riders such as Lizzie Armanto, Allysha Le, Brighton Zeuner, Jordyn Barratt, and more each got three runs to show off their top tricks, style, and lines, and so I stood above on the deck somewhere reaching over, under, and squished between a line of photographers to get the shots. Allysha Le, lien air don’t care. Photo: Bandy. Nicole Hause, Indy air. Photo: Grove. As the vert mellowed out and the last runs were taken, I then hopped over to grab a few shots on the street course; I’ve never really skated or shot street skating for some odd reason, but watching girls such as Lacey Baker tearing it up, I knew I at least had to pull out the 70-200 and capture a few tricks. The street competition worked as a five minute open run, where a select group of girls would skate freely around the plaza showing off their best tricks where they could. Judges like Willy Santos, Garrett Hill, Brian Hansen, and Neal Mims watched over the competition, and in the end Alexis Sablone took first in Pro. At this point, the sunlight was growing weaker, and with the little time left in the day, the Pro Bowl competition began. The sun went down, and simultaneously a group of 14 girls age 12-24 were throwing airs, slashing grinds, and transferring over hips. 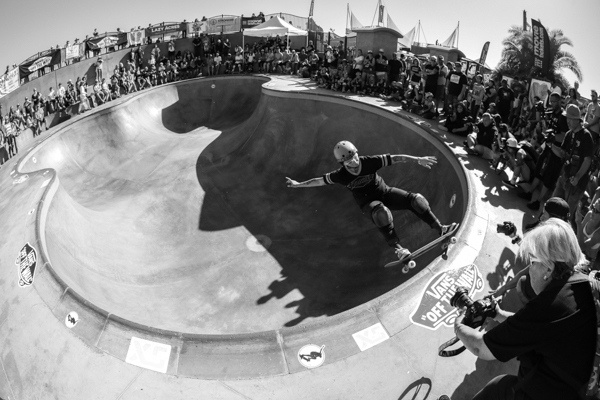 The highlight of the pro bowl, for me, had to be seeing 12 year old Brighton Zeuner absolutely killing it in the bowl, and to see her progress so much from last year’s event, and the previous sessions I’ve seen her skating at poods. 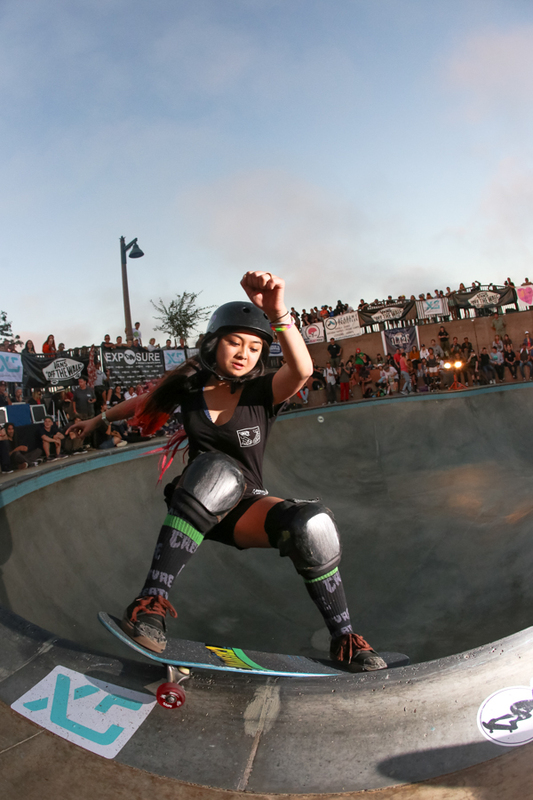 At 12 years old, taking first place in the pro bowl of the largest women’s only skate competition, this girl is going places! If you get a chance, I recommend pulling up a video of her from the contest, and see just how a 12 year old girl skates. Jordy Barratt, method air in the deepend. Photo: Bandy. Nora Vasconcellos, grinding through darkness, and lights, and flashes. Photo: Bandy. Brighton Zeuner, backside air. Photo: Grove. 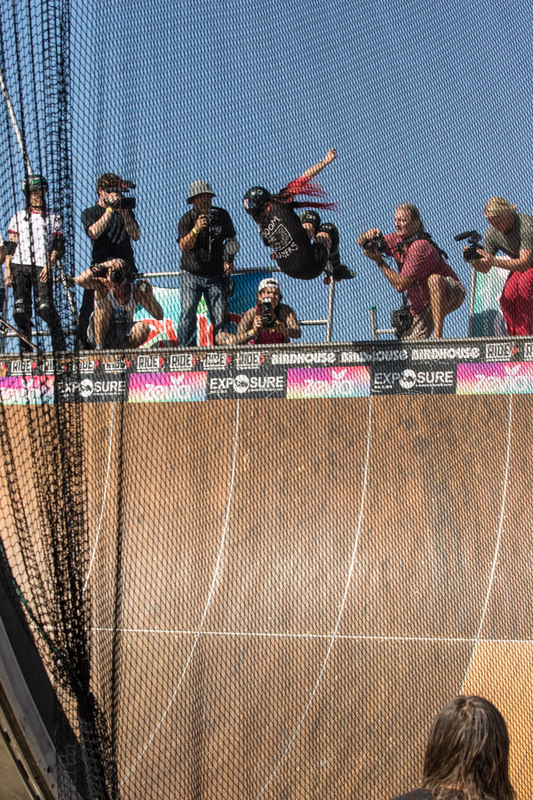 The event came to a close as the sky turned black, and proved to be another unique and inspirational day of female shredding. Women’s skateboarding is what’s happening right now, and is growing faster than ever, with more girls out and about skating everything in their path, with tricks, style, and most importantly, fun and a smile. Just as the weekend’s competitions proved, it’s not just about who’s the best, can land the biggest air or trickiest trick, but building up a community through positivity, encouragement, and of course just getting on a board. I know the next few Exposure contests will showcase the growing portion of the sport, and am hyped to see where these girls are taking skateboarding. Shred on! 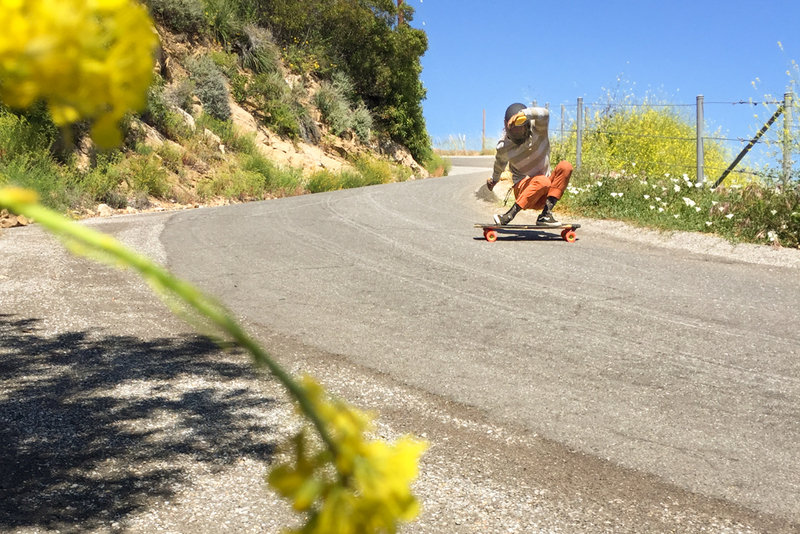 Brighton Zeuner with a speedy lipslide. Photo: Bandy. Jules, runnin’ it. Photo: Bandy. Hanna, boostin & bonin’. Photo: Bandy. Nicole Hause with a final invert into the dark to end the contests. Photo: Grove. Thank You’s: Massive thank you goes out to Amelia Brodka, Lesli Cohen, and everyone else that makes this event happen the way it does every year. Heal up Amelia! Also, working with Dave Bean, Curtis from Skate the Lake, Alec Beck, Calli Kelsay, and so many other volunteers to setup and tear down, they really play an important role in how the event goes down. Thanks dudes! 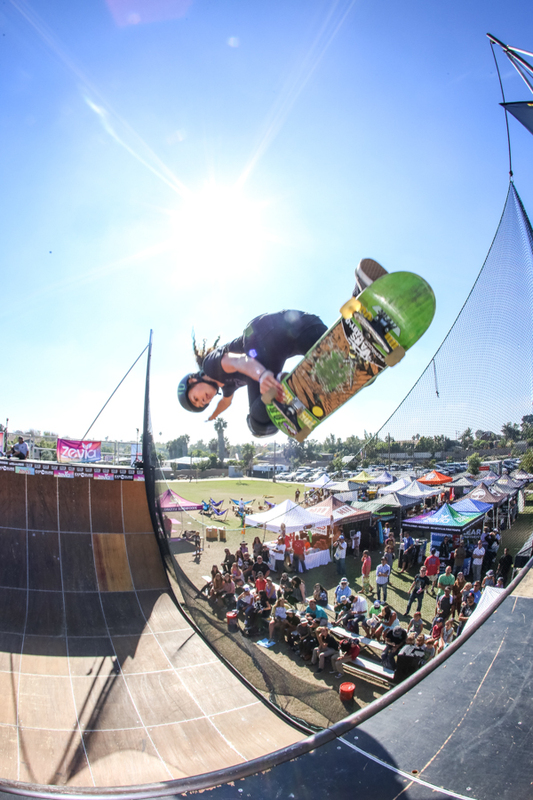 All the sponsors and vendors that contributed to the event kept the stoke flowing, and helped Exposure to acheive their goal in both growing skateboarding and supporting survivors of domestic violence. Check out the full list of sponsors at exposureskate.org. Lastly, thank you to all the girls that kept the event alive and showed us how rad women’s skateboarding is and is growing to be. 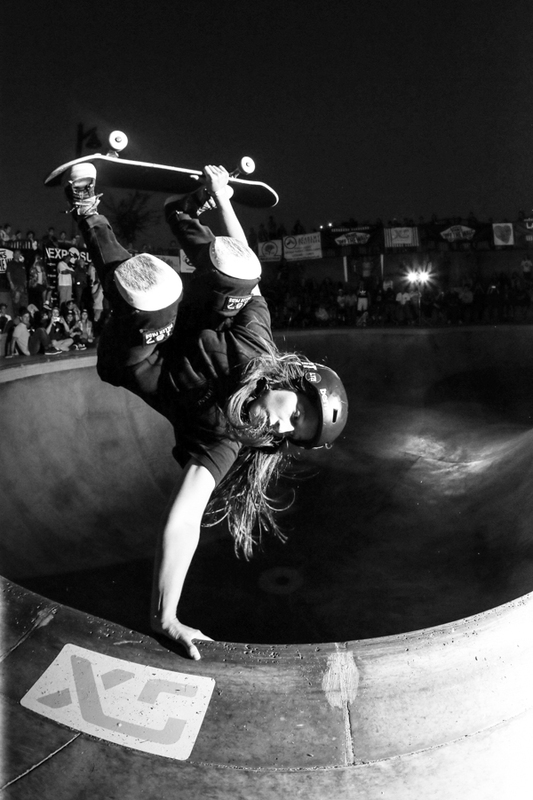 All of you contributed to one amazing skate scene, and the support for one and other kept the stoke flowing. Keep on keeping on! MENLO PARK SKATE JAM, 2016 Olympic Games 2020: Skateboarding Is A Sport Barrett Junction Outlaw, 2016. 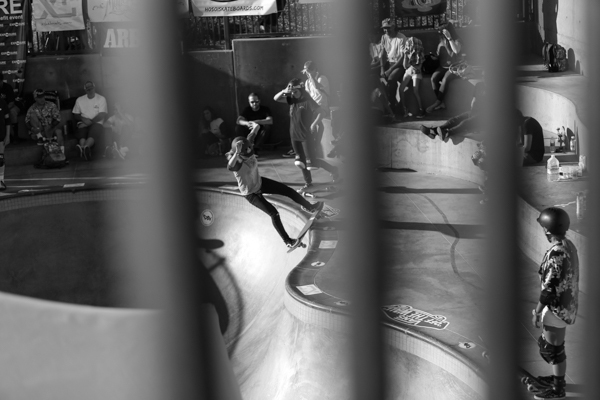 Exposure, 2015: Empowering Women Through Skateboarding.